My Sternguard squad for my Astral Claws has been a real slow burn project. I started them right when the unit came out in plastic and have been working my way through them ever since. The newest member to join their ranks is the heavy flamer toting Battle-Brother Gibil. I had started this guy almost half a year ago. All of his silver armor was done except for the battle damage and then he was left to sit on my pending projects shelf and stare at me in disapproval. About a month ago I was waiting for something to dry and picked up this guy to entertain myself. What was meant to be a minor painting session of maybe finishing up the silver turned into a week long project that saw him completely done. One of my favorite parts to paint on these guys is the blue. The basecoat is a mix I made up a few years ago of about one half Regal Blue and one half Enchanted Blue. I then shade it with either P3 Armor Wash on the hard surfaces or a mix of my basecoat and black for the cloth. These are then highlighted by mixing in Ushabti Bone. The armor panels are pretty straight forward but the cloth has a ton of blending and going back and forth between steps until it's just right. The gold on this guy was also a nice way for me to get back into the swing of that color for Valten, who was painted next. 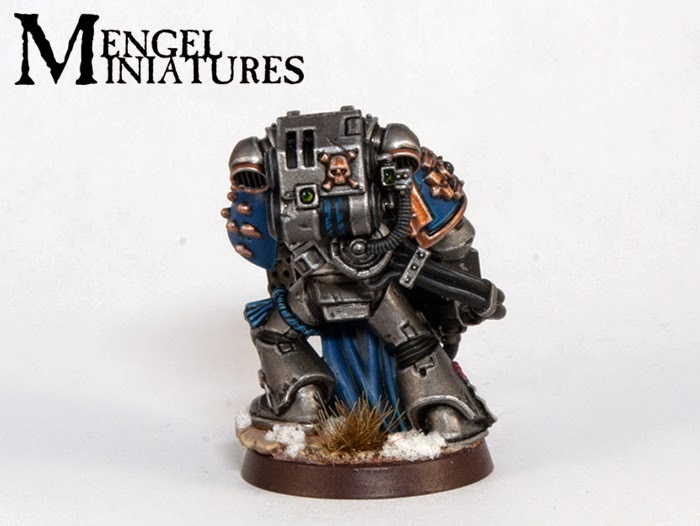 My Astral Claws have really taught me how to master metallics. This is probably one of the reasons I don't like to do NMM (non-metallic metals). Unfortunately I feel like Gibil suffers from "least interesting pose in the unit" syndrome. On his own he looks pretty cool, but compared to the rest he just lacks dynamism. This is of course due to his massive heavy flamer, which also blocks a lot of the really nice detail on his chest, knees and loincloth. While it makes him suffer a bit individually, I do think it helps the squad as a whole and gives them a member who is really solid and imposing. 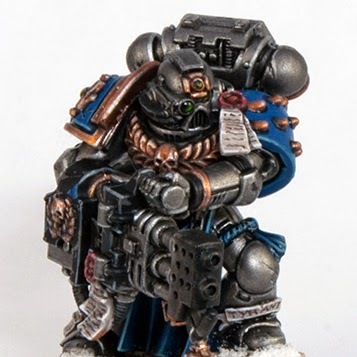 My plan is to finish up the last remaining member, the Sargent, and a conversion I have made for Captain Corien Sumatris, and enter them as a unit into the Crystal Brush. I only have three months left to go and still have my main entry to complete, so we'll see how it goes. I have a few ideas for other models to enter which either require no work or just minor touch ups, so my hope is to have five or six entries total. Below you can see the video for Battle-Brother Gibil. The music has once again been provided by the very talented Adam Harvey. You can follow him on his Facebook page. This particular song is actually from the newest trailer for The Lord Inquisitor. When I first started this army I decided to give each and every marine a name and a small back story to make them truly unique. Gibil, by the way, is a Babylonian fire god. I thought it was a fitting name. 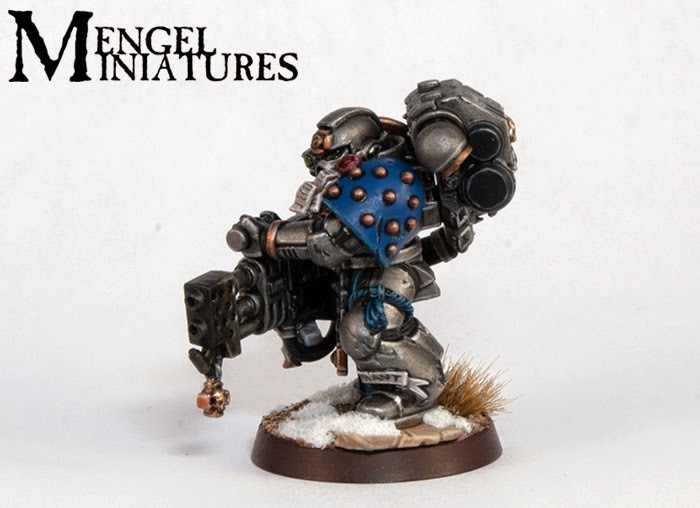 Gibil started his career within the Astral Claws as many did. He was a loyal and dedicated Space Marine, willing to give his life for the Emperor and the Imperium. 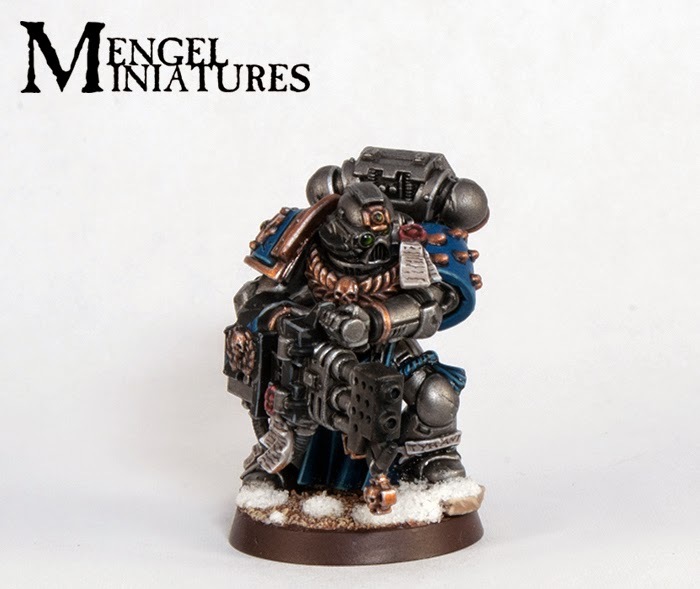 When Huron became Chapter Master, Gibil had only just been promoted to full Battle-Brother from the ranks of the scouts. Displaying remarkable aptitude he was quickly promoted to the third company. He served with distinction, helping Huron in his quest to cleanse the Maelstrom. When an Astral Claw strike force was ambushed by the vile Eldar Gibil's squad was cut off and faced with almost certain defeat. 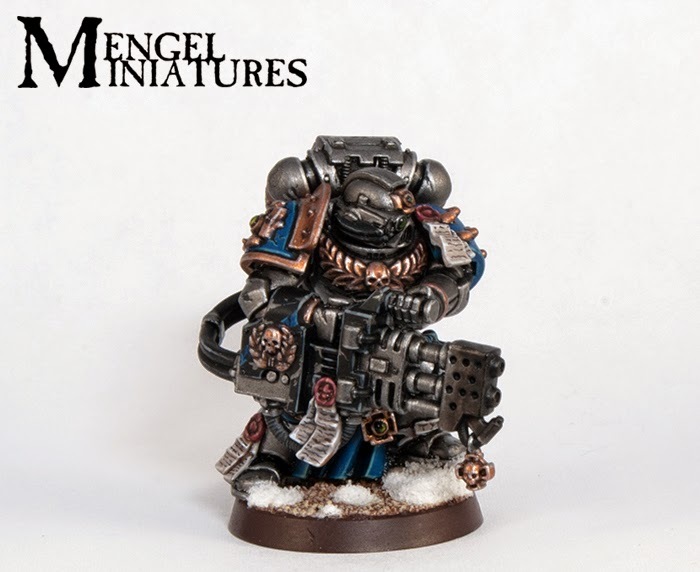 Once the squad's flamer bearer was brought low Gibil retrieved the weapon and proceeded to immolate the remaining xenos, saving the lives of his surviving squad mates. This action saw him promoted to the ranks of the first company and the Sternguard. Once Huron declared war against the Imperium he was reassigned to the ranks of the Retaliators. At first he was wary about the changes he saw occurring within his Chapter. He didn't understand some of the darker urges taking over his Brothers or their complete disdain for mortals. He was deeply conflicted. These were his Brothers whom he would gladly die for, but he could not abide by their choices. On several occasions he came close to trading blows with his fellow marines. After the Astral Claws began losing ground and started pulling back towards Badab, Gibil was finally given his chance at redemption. Not wanting to follow his Brothers into damnation but unable to turn against them he sold his life during a particularly brutal boarding action. A Red Scorpions fleet had them caught completely off guard as they prepared to make the jump to the warp near the outermost edge of Badab controlled space. While the majority of the Astral Claw fleet was able to withdraw safely, the strike cruiser carrying Gibil's squad was hit with boarding torpedoes as they fled. As the loyalist marines tore their way to the bridge, Gibil stood defiant, blocking their path in the final hallway. 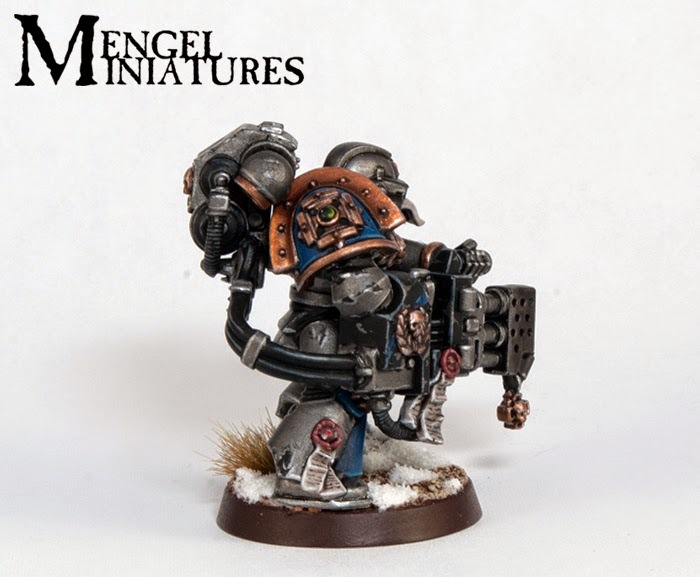 Arming himself with his Heavy Flamer and a reserve bolter and combat knife, he stood on his own to allow his squad time to circumvent the attackers. By the time Buvalu and the others made it through the ships twisting corridors to attack the Red Scorpion's rear only a few still stood. The rest littered the floor as burnt and charred corpses. Unfortunately it was to late to save Gibil, who laid unmoving, slumped against the far wall, his promethium tanks empty and his body riddled with bolt holes. Thus was his tortured conscience laid to rest, serving his Chapter to the last and ending his betrayal of the Imperium. Post-Badab War: While initial reports stated that Gibil died defending against a boarding action in the closing phases of the war, Inquistorial reports compiled from first hand accounts and numerous interrogations point to a much darker fate. According to several chapter serfs captured after the fall of Badab, Gibil did not actually perish. When he was found slumped against the wall, the faintest trace of life still lingered within him. Although he would remain out of action for the remainder of the war, it appears he was kept alive within the Chapter's Apothecarium in a comatose state. As fate would have it the strike cruiser he was aboard was used by the traitors to flee the Imperium's wrath. Further accounts tell of how any attempts to awake him by traditional methods once within the safety of the Maelstrom were met with failure. Not wanting to waste a valuable Astartes with so few numbers remaining, Huron authorized a dark ritual to revive Gibil. While none of this can be verified as completely true, battlefield reports indicate a horribly possessed and warped Red Corsair matching Gibil's description. This marine seems to throw himself headfirst into the enemy lines, spouting green warp flame from his twisted form. He seems intent on seeking his death and is only restrained by his Brothers bodily hauling him back with chains and sorcery. Whether this is in fact Gibil, or if any of his souls remains may never be discovered.